It's only when you let go of all the labels society has placed upon you, that you can allow your true self to show through and #JustBeYou. I've partnered with prAna & Stonyfield to show you how easy it is to #JustBeYou. Both brands offer versatile and sustainable products so you can decide your style, your flavor and exactly how you want to express yourself in the world. 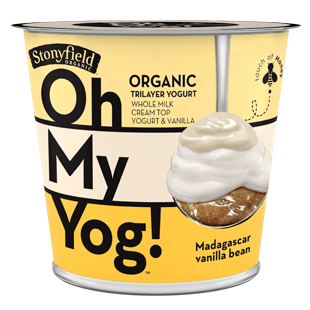 For those that don't know, Oh My Yog is an organic triple layer yogurt from Stonyfield. There is fruit on the bottom, whole milk yogurt in the middle and a thick cream on top. They are not "yogurt for breakfast" type yogurts, but rather a healthy dessert choice.You will not be disappointed indulging in one of these yogurts. prAna is an active lifestyle brand that creates men and women's clothing that are environmentally friendly. Whether you are into traveling, hiking, doing yoga or taking a casual stroll prAna has something for you. prAna clothing is something special. Not only do I love how the Freya leggings fit, but I also enjoy the way they feel. I knew the minute I slipped them on that they would be my new favorite workout pants. When you workout everyday, comfortable clothes are a priority and prAna takes comfort to the max. A blend of soft hemp and organic cotton makes them soft and breathable, unlike the synthetic pants I typically wear. Both brands offer several options making it easier to #JustBeYou. How I see myself in the world is wearing the prAna Freya Knicker on a long desert hike and enjoying an Oh My Yog Madagascar vanilla bean yogurt at the end. The apple cinnamon flavor and jada jeans! I like the Catarina jacket! Gingered Pear yogurt and the Avril pant allow me to be me. Love them both! I like the Jada jeans! The Oh My Yog sounds pretty fab, and PrAna is one of my fave workout brands! Nice! I just love the back of the dreaming tank top. I think the Lined Boyfriend Jeans allow me to #justbeyou because they are comfortable and stylish! Love the prAna Crossing Cord Pant. Never tried Oh My Yog! Have not seen it sold in my region. I love the Trista skirt! The lined boyfriend jeans! They look so casual and comfortable. I like the Uptown pant, and I want to try the Gingered Pear variety. They have so many awesome options and the yogurt sounds so good! I would love the Misty Legging in burgundy! The yogurt sounds good and snazzy pants! I'm such a sucker for a big beautiful sweater! The Angelica Duster in Deep Balsam looks like a dream. I would really like to eat some Apple Cinnamon yogurt while wearing the Kara jeans. I've never heard of this brand of clothing before but I love the patterns. I am loving the Peppa Jacket and the Wild Quebec Blueberry Yogurt. I would love the trinity cord pant! And that yogurt looks amazing! I see myself wearing the Marin Pullover Top after a yoga session while I snack on the Apple Cinnamon yogurt. What a fantastic giveaway! I would enjoy the pullover top after a yoga session and that Madagascar vanilla yogurt! I like the Rochelle sweater paired with the gingered pear yogurt! Those are so cute! I love the Jada jeans! The Meryl Sweater Dress in nautical and the Wild Quebec Blueberry. Whoa, I have never seen that yogurt before - it looks amazing! I love the Minoo sweater! It looks so cozy. Also I need to try that yogurt! I love the madagascar vanilla flavor and the freya knickers! I love the apple cinnamon flavor and Mantra pants. I would love the Lindy dress! I have never tried this yogurt before, but I would love to. I think the Peppa jacket and Pacific Coast Strawberry sound like me. The Drea Jacket in sail blue and Madagascar Vanilla Bean sound great. I eat so much yogurt everyday, and when I want something sweet. Vanilla bean would be perfect with a tiny sprinkling of granola. Gingered pear and the Meryl sweater dress. i think the kara jeans from prAna would allow me to #justbeyou! i spend a lot of my time chasing around my 9 month old who just started walking and most days i'm so busy that throwing on a pair of jeans is just easiest (and comfiest). except i only own one pair and they have big holes in the knees (from crawling around the floor with said 9 month old haha). and the vanilla bean flavor yogurt sounds right up my alley and perfect for my quick lunches! I want those pants, so cute! I would love the fingered pear yogurt and the Marin pullover top!